If managed correctly, key performance indicators can be valuable tools. With the Centers for Medicare & Medicaid Services tying 90% of Medicare fee-for-service payments to quality or value by year's end under its Hospital Value-Based Purchasing (VBP) program, hospitals are increasingly turning to key performance indicators (KPIs) to ensure proper payments. By monitoring the appropriate metrics, organizations can quantify performance, identify areas of weakness, and initiate change to avoid being hit with VBP penalties and to ensure revenue cycles operate at peak efficiency. "An important part of reaching revenue goals is that your organization needs to be able to measure the impact of revenue drivers and organization-defined success criteria [such as strategies and tactics]," says Richard L. Gundling, FHFMA, CMA, senior vice president of the Healthcare Financial Practices division of the Healthcare Financial Management Association (HFMA). "Operating without KPIs is a little like driving a car without a dashboard or flying an airplane without an instrument panel. A dashboard of KPIs helps you focus on the relevant pieces of information that drive performance. Without the ability to measure what you're trying to achieve, it will be a challenge to know whether you're on target to achieve your revenue goals." 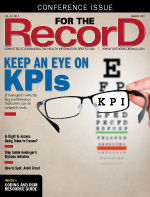 According to HFMA, KPIs are "well-defined metrics that illustrate performance." When properly defined, KPIs deliver actionable information to help health care organizations optimize the complete revenue cycle, including financial outcomes, staff productivity, and business operations. Noting that "the 'key' in key performance indicator should guide analysis in the areas most important to your organization," Gundling recommends selecting strategic and operational KPIs based on how well they provide analysis and evaluation of the critical processes that drive the most significant performance and business initiatives. "Strategic measures tend to focus on outcomes as well as provide data that can be used to benchmark performance against your peers," he says. "Alternatively, operational or tactical measures will evaluate the effectiveness of your organization's business processes. Typically, these measures will be more distinct and homegrown to your organization." For example, aged accounts receivable (A/R) as a percentage of billed A/R by payer group is a strategic measure that highlights the collectability of A/R. Operational KPIs include employee productivity and performance—for example, the number of registrations completed each day—that directly impact revenue cycle operations. • Hospital Consumer Assessment of Healthcare Providers and Systems (HCAHPS). "[HCAHPS] is especially important because of how closely patient satisfaction and the financial growth of health care organizations are aligned now," Lachney says, adding that looking to trusted organizations such as HFMA and the Medical Group Management Association is one way to determine which KPIs are the most appropriate. "Benchmarking against peers is another way to ensure your financials are on track with where you've forecasted your organization to be." Lachney, who says KPIs are the best way to evaluate the revenue cycle team's contribution to achieving financial goals, points out two mistakes many health care organizations make when defining and using KPIs to measure performance. One is failing to monitor KPIs daily, which is necessary to detect patterns and take action. The second is disparate technology running financial reports, making it "challenging to have the clarity [needed] across all hospitals." It's better to have "reporting and data and analytics tools that offer transparency for leaders to see what's really going on in their financials, down to the individual provider level," he says. HFMA policy analyst Chris Koopman says how often an organization monitors its KPIs depends on how much performance is impacting finances and how far it is from the industry average or best practice. "If the situation is critical, more attention is necessary. Once you're able to confirm you have stable KPI performance due to well-managed processes, it's probably safe to decrease the frequency and intensity of reporting around the KPI," he says, adding that "frequency also can depend on the process or outcome you're trying to measure and the data available for measurement." For example, for higher-level strategic KPIs such as net days in A/R, measuring monthly or quarterly may be best, given data availability. Tactical KPIs such as DNFB that feed higher-level KPIs should be monitored on a daily or weekly basis. "If you manage the tactical KPIs well, you'll be able to limit adverse impacts on strategic KPIs," Koopman says, adding that if there are too many metrics to monitor, it can "dilute and distract attention from the most pertinent data and information. "If your KPI dashboard is extremely busy, it can be a real challenge to get a management team to agree and focus on the most important business processes and KPIs," he says. "Lack of succession planning and staff training can leave cracks in the aggregation and reporting side of KPI management. It's important to build an organization or department that can pick up the slack when those who are responsible for reporting transition away from those responsibilities. KPIs do not solve problems. They are indicators that should help you monitor your environment. Understanding the key components that impact each KPI and how you can affect them is an important, and sometimes overlooked, concept with KPI management." Laura Legg, RHIT, CCS, CDIP, executive director of revenue integrity and compliance for Healthcare Resource Group, agrees that keeping KPIs "few, relevant, and simple will go a long way in making the performance improvement successful," whereas too many "can lead to poor measurement processes as well as staff burnout." To avoid negative outcomes and ensure KPIs are providing the necessary insights, Legg recommends focusing on those that dovetail with an organization's overall goals and objectives. Executive teams should be responsible for setting expectations and providing feedback. Managers, meanwhile, should be responsible for the tracking and measurement process the executive team will need to identify the KPIs that are tracked, as well as assist in the measurement design process. Legg cautions that even when properly defined and monitored, KPIs can still come up short. They can only represent a number. "We still need human communication to find root causes and improve performance. KPIs cannot replace effective leadership and investigation of issues and practicing performance improvement techniques so that standards can be met," she says. Gundling says another shortfall of KPIs is that higher-level, strategic metrics are lagging indicators. "[They can only] provide an after-the-fact view of what happened during a reporting period," he notes. "So, there can be a significant amount of time between the actual performance period you want to monitor and understanding the outcome for the period. "It's also important to keep in mind that the 'garbage in, garbage out' rule applies to KPIs—your metrics are only as reliable as the data used in monitoring them. If the data are not clean, the KPIs' value to decision makers weakens significantly." On the plus side, KPIs assist in the development of strong, consistent business processes that guide organizations toward their goals by focusing on the relevant pieces of information and data that truly impact goal outcomes, Gundling says. From a communication and transparency standpoint, they are useful in articulating to management the impact of goal-related initiatives and strategies. Just as health care itself is evolving, so too should KPIs. Legg points to the move to ICD-10, which "changed the KPIs for coding accuracy and productivity and their importance." Specific to coding, other performance metrics to gauge an organization include a 95% coding accuracy rate, a 99% clean claims rate, or ensuring charge capture errors—or missed charges—occur on less than 2% of accounts or claims. "By monitoring consistent metrics, you can start to see trends," Lachney says. "For example, you may see that in one particular employed practice there is a high denial rate and that may lead to an assessment which highlights the need for improvement in clinical documentation." Koopman says the need to evolve depends on the KPI. For some, the value lies in the static nature of the measurement, and the KPI definition may not evolve much over time. The value in industry-standard KPIs is that most organizations can utilize the KPI to measure and benchmark against peers. If these KPIs change often to the point that many organizations may not be measuring and reporting the same KPI similarly, then the value of the KPI diminishes. "As technology, consumer preferences, and markets evolve, many of our business processes evolve along with them. Tactical KPIs used internally by an organization are useful for identifying opportunities for improvement and weaknesses in business processes," Koopman says. "In these instances, new or modified KPIs will be necessary to keep up with the pace of change to meet consumer demands and preferences. For example, as consumerism becomes more prominent throughout health care, metrics and KPIs need to be developed for processes that touch the consumer such as out-of-pocket price estimate accuracy and timeliness. The speed at which actionable data become available will also continue to influence the types of data that are measurable."